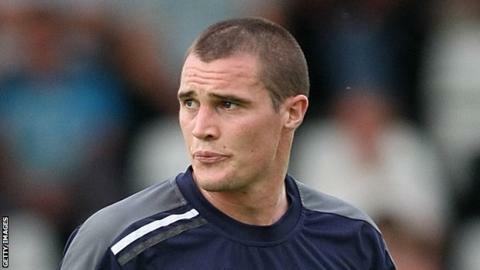 Darren Murphy has left Macclesfield Town by mutual consent after only two weeks to return to his native Ireland. Midfielder Murphy, 27, joined the Silkmen on transfer deadline day, but failed to make an appearance. "He's a great lad and a good player so it's a shame he's not been able to show that with us," boss Steve King told the club website. "He has made the request to return to Ireland for personal reasons and returns there with our best wishes." Cork-born Murphy, who began his career with Cobh Ramblers, moved to Stevenage in 2008 and helped Boro to back-to-back promotions from the Conference into League One. However, he was released at the end of last season after hamstring problems and after a brief spell at Port Vale, joined Macc at the end of January.